Home › Lesser fish eagle › Grey-headed fish-eagle - Icthyophaga ichthyaetus. The grey-headed fish-eagle (Icthyophaga ichthyaetus) belongs to the family Accipitridae. These grey-headed fish-eagle species are distributed in Indian Subcontinent, Southeast Asia, Indonesia and Philippines. Icthyophaga ichthyaetus was earlier classified under genus Falco. The genus Icthyophaga (del Hoyo and Collar 2014) was previously spelled Ichthyophaga. The grey-headed fish-eagle is a large bird, measuring 60 to 75 cm in length and weighing 1,600 to 2,700 grams. Female eagles are larger than the males. The wingspan is 150 to 170 cm. The adults have dark brown upper body, greyish head and lighter underbelly. The bill and head are small. The thighs and legs are white. The tail is rounded and white with a broad black subterminal band. The grey-headed fish-eagle inhabits forested wetlands, rivers, lakes and tanks. These eagle species feed mostly on live or dead fish. They also feed on small mammals, reptiles and birds. The grey-headed fish-eagle breeding season in north India is between November and January. A huge nest is built on tall trees with sticks and leaves. Trees near water bodies are prefered. The clutch usually contains two to four eggs. Both the parents take part in incubation, foraging and fledgling feeding. These grey-headed eagles species are distributed in India, Nepal, Sri Lanka, Bangladesh, Myanmar, Thailand, Laos, Vietnam, Cambodia, Malaysia, Singapore, Brunei, Indonesia and Philippines. 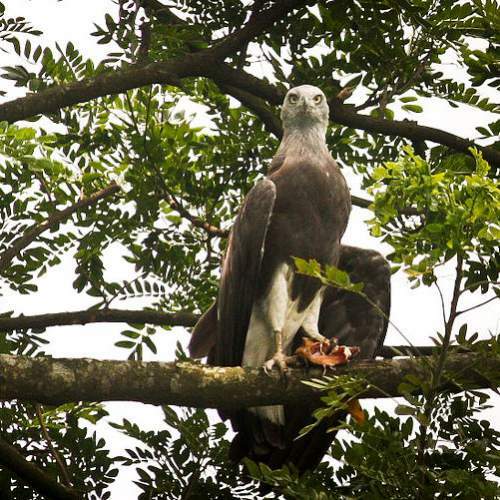 The grey-headed fish-eagles are sedentary and make local movements for feeding. These grey-headed eagle species global population is estimated to be 15,000 to 150,000 individual birds. There is rapid decline in the population and the species are considered 'near threatened'. These eagle species are facing threats of loss of forested wetland habitats and overfishing of the feeding grounds. Current topic in Birds of India: Grey-headed fish-eagle - Icthyophaga ichthyaetus.